HT Media Ltd, the publisher of dailies including Hindustan Times, Mint and Hindustan, has reported a 43 per cent rise in revenue from its digital business for the third quarter ended December 31 to Rs 38.2 crore from Rs 26.7 crore a year earlier. This was driven by 81.6 per cent growth at HT Mobile, the company's mobile platform, besides growth in ad income from its news portals and 23.1 per cent rise in business from job portal Shine.com. It also cut its segment losses from the digital business from Rs 14.4 crore to Rs 11 crore. Meanwhile, the media company's operating revenue for the quarter rose to Rs 681 crore from Rs 605.5 crore in Q3 FY15. Net profit rose at a comparatively slower rate of 7.6 per cent to Rs 68.8 crore. "Growth in revenue and our continuing focus on costs have resulted in higher profitability," said Shobhana Bhartia, chairperson and editorial director, HT Media Ltd. She said the Hindi business continues to grow profitably and HT Mumbai and HT Delhi businesses saw year-on-year revenue growth. "We successfully re-launched the Chennai radio station; and our digital businesses have reduced losses even as they have grown revenues," she added. Advertising revenue for the quarter ended December 31 stood at Rs 542.5 crore, up 9.2 per cent from Rs 496.7 crore a year earlier. The rise in advertising revenue is primarily due to increase in ad volumes. Circulation revenue rose 4.8 per cent to Rs 76.9 crore. Earnings before interest, tax, depreciation and amortisation (EBITDA) in the quarter rose 11.6 per cent to Rs 145.7 crore. In the next financial year, the media company plans to focus on starting new radio stations acquired in Phase-III airwave auctions. 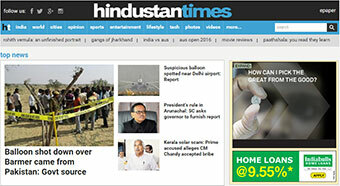 HT Media shares on Wednesday fell 2.6 per cent to close at Rs 77.20 in a flat Mumbai market.